Matt Thorpe, with Colorado Parks and Wildlife, looks over the structure that holds the bear cubs after it was completed on Friday in the mountains west of Durango. 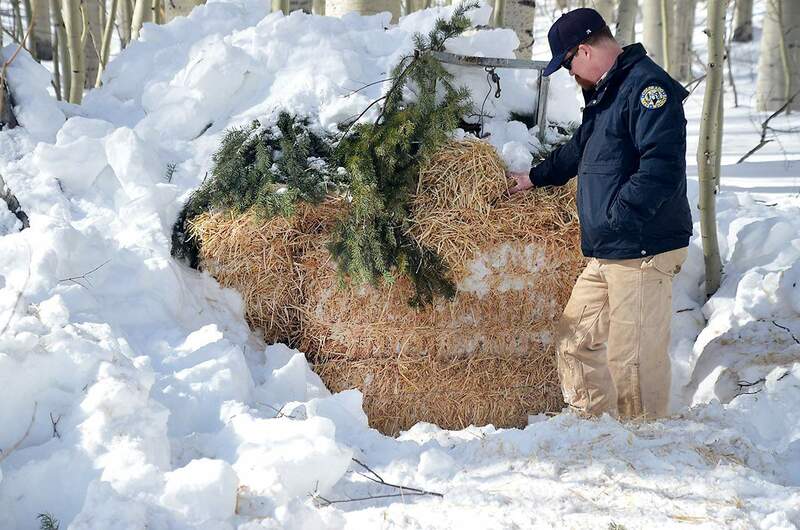 They constructed a “den” site and placed a steel box – which held one other bear – in a remote location and covered it with hay, evergreen branches and snow. The bears will probably emerge in mid-April. 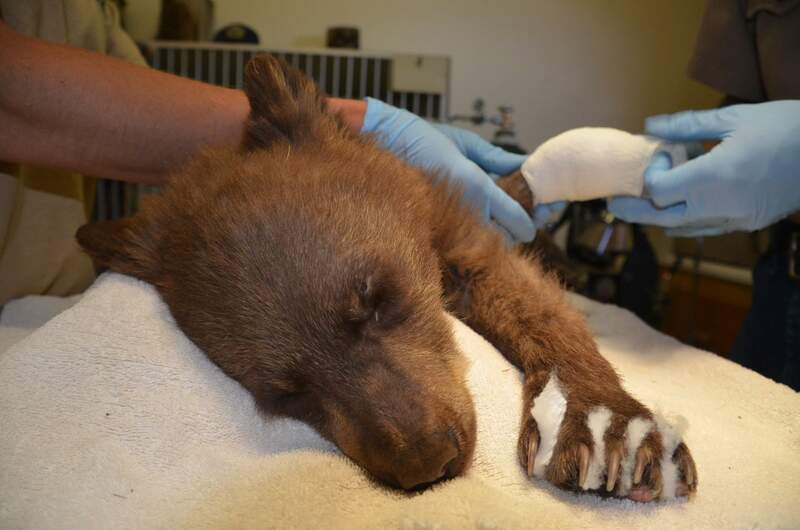 It has been a long, difficult journey for the bear cub injured last summer during the 416 Fire. But on Friday, she was released back into the wild, in good health and with another chance at life. In June, as the 416 Fire ripped through the San Juan National Forest north of Durango, firefighters found the female cub, only a couple of months old, in the Junction Creek area without her mother. A few days later, CPW tranquilized and captured the bear after finding her alone in a tree, her paws burned by the fire. For the next several months, the bear received care at a wildlife rehabilitation center in Del Norte. This baby cub was spotted in the Junction Creek area by firefighters battling the 416 Fire in June north of Durango. When it became apparent its mother was gone, crews called Colorado Parks and Wildlife, which captured the cub, treated its burned paws, and on Friday returned it to the wild. 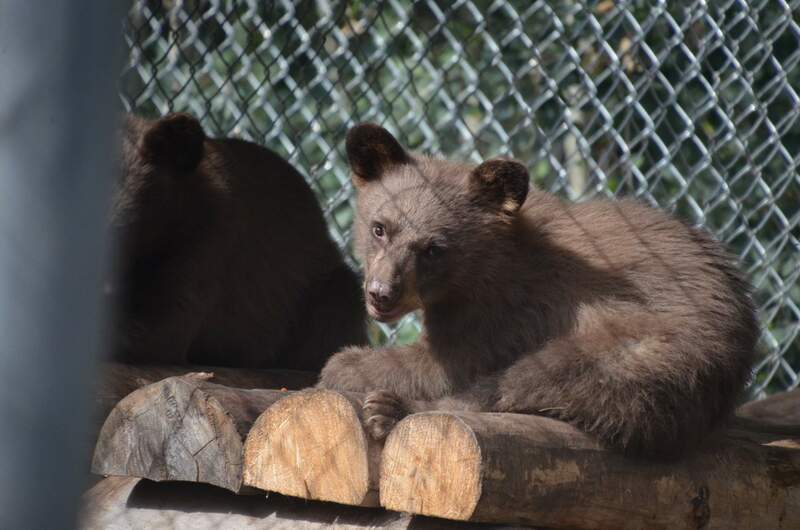 Michael Sirochman, manager of the Frisco Creek Wildlife Rehabilitation Center, said the first priority was getting the burns on the cub’s paws bandaged and healed. Then, once she could walk, the bear was placed in a pen with other orphaned cubs. Of the utmost importance in caring for all abandoned cubs, Sirochman said, is to keep the animals’ wild instincts alive and limit human interaction. After its paws healed, a bear cub injured in the 416 Fire was placed in a den with other bears. Colorado Parks and Wildlife released the bear Friday in the San Juan Mountains, where she is expected hibernate until spring. Just as important, Sirochman said, is fattening up the cubs so once they are released into the wild in the winter, they have enough fat reserves to get a good head start on learning how to survive. The bear burned in the 416 Fire, thought to be about 5 months old, came to the center weighing about 10 pounds. Now, she weighs a little over 90 pounds, Sirochman said. In November, CPW staff started to taper off the amount of food given to the bears in an attempt to induce them into hibernation. This year, the bears remained mostly active until a cold snap hit, lulling the bears into their winter sleep. The bear burned in the 416 Fire was placed Friday in a crate in a human-made den at a location in the San Juan Mountains, west of Durango, along with another orphaned cub, also from the Durango area. CPW said bears have a better chance of survival if paired together. A Snocat carries Colorado Parks and Wildlife officers on Friday as they return a bear cub hurt in the 416 Fire, to the mountains west of Durango. They constructed a “den” site and placed a steel box – which held one other bear – in a remote location and covered it with hay, evergreen branches and snow. The bears will probably emerge in mid-April. Thorpe said the location was specifically chosen because of its favorable habitat for bears. Hopefully, the cubs don’t wake up until April or May, he said, when available food sources are around. CPW doesn’t have hard data on the success of bear cub reintroductions, Thorpe said, because of lack of funding for things like GPS collaring. But, he said CPW does everything it can to put the bear in the best condition for survival, like putting on body weight so it has time to figure out life on its own. There are several threats to the survival of reintroduced baby bears, including starvation, being killed in territorial fights with other bears, and predators like mountain lions and coyotes. Also, there is an added risk from humans, like getting hit by a car or becoming a problem bear with trash. 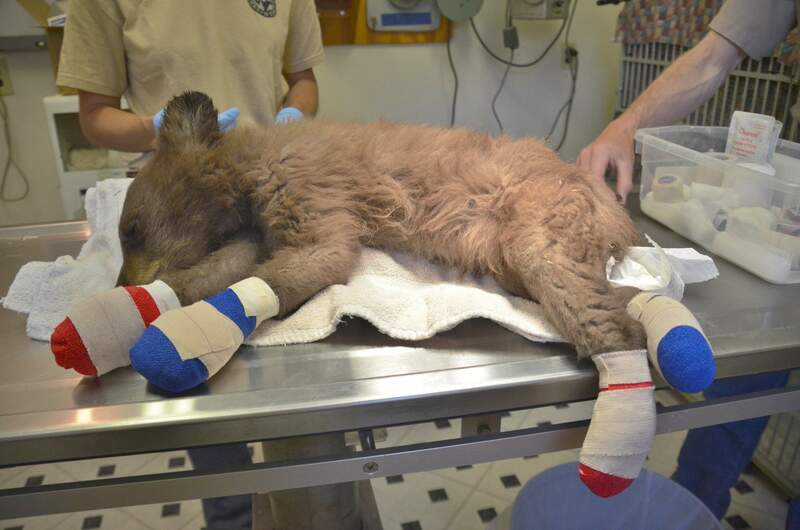 This baby cub was found abandoned in June north of Durango, injured by the 416 Fire. Since then, the bear has been in rehab. 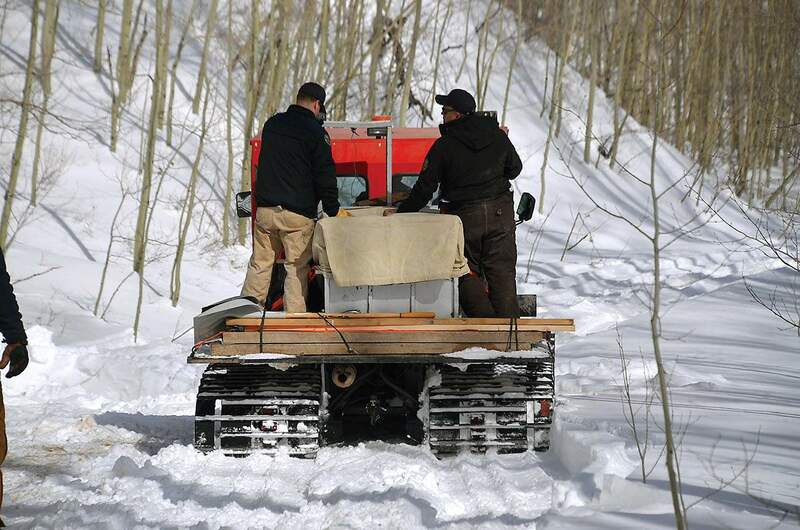 She was placed in a man-made den Friday in the San Juan Mountains, where she is expected hibernate until spring. It’s anyone guess how the bear burned in the 416 Fire will fare in the wild. Abandoned at such an early age, she didn’t have the benefit of learning from her mother, so Thorpe said there are some skills she hasn’t learned yet. But, she does have some factors in her favor. Female bears are less likely to be killed in territorial fights with other bears. And, at 90 pounds, she had a good amount of body fat to remain healthy while figuring out how to forage for herself. Although the cub doesn’t have a GPS tracking device on her, she was clipped with a white tag on her ear with an identifying number.